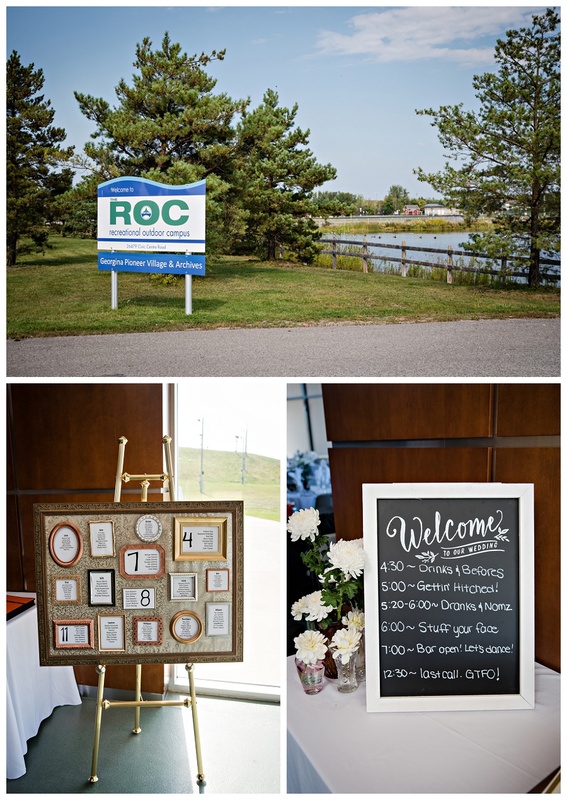 Emily and Bill held their ROC wedding on an unusually blazing hot day at the end of September. It was somewhere around 35*C! 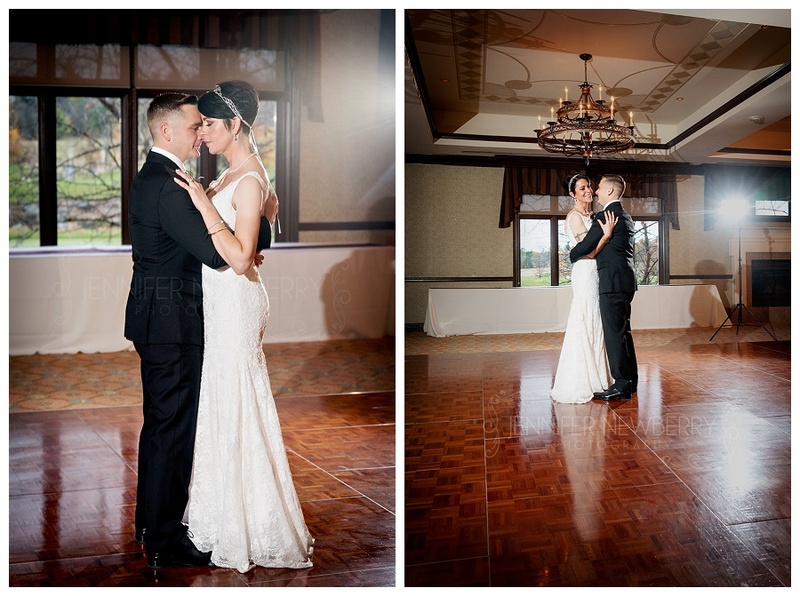 Besides the unusual heat, everything went absolutely perfectly! 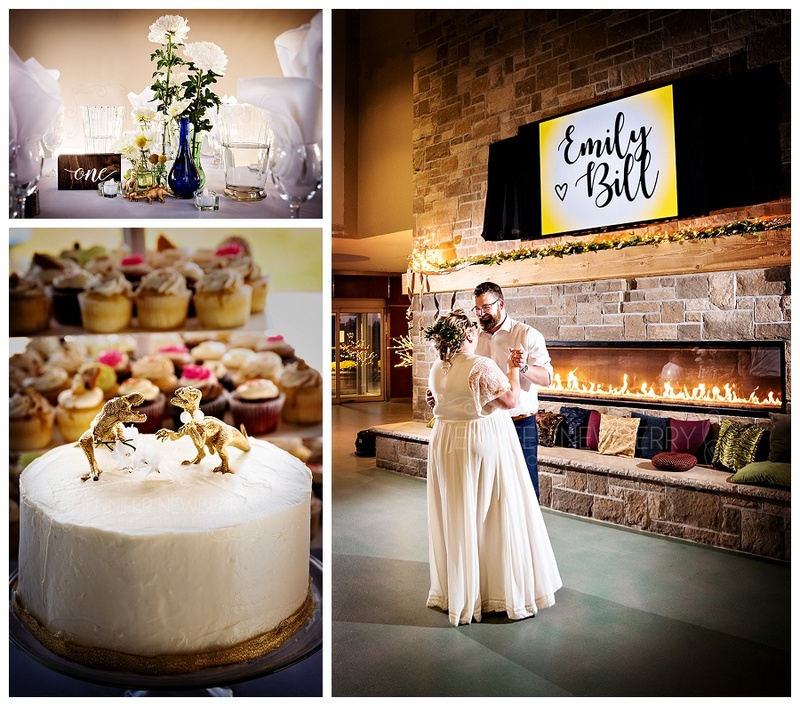 Emily and Bill had very elegant decor with a “light sprinkling” of golden dinosaurs – yes, golden dinosaurs. 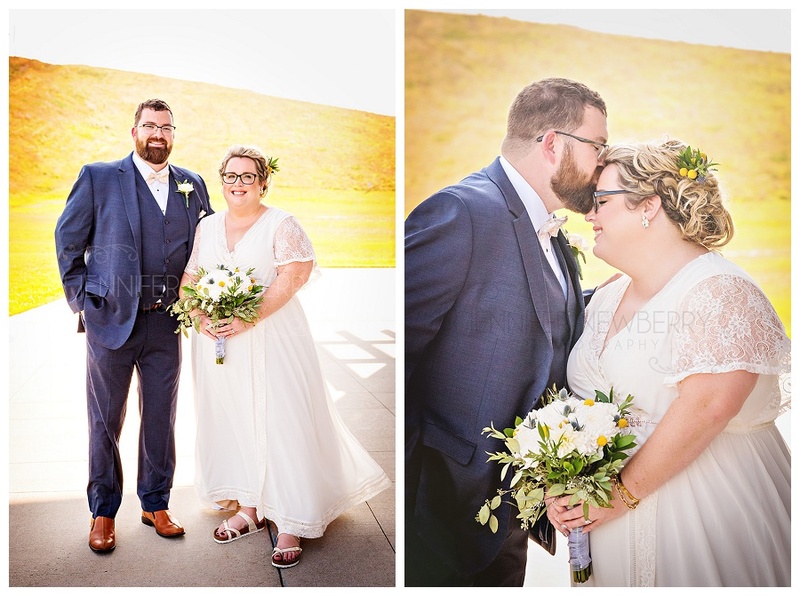 A lot of people were asking “What’s up with the golden dinosaurs?” and they all had to wait for the bride and groom’s speech to find out the answer. I believe Emily’s exact words were “Dinosaurs are the best, so just calm down.” hahaha! 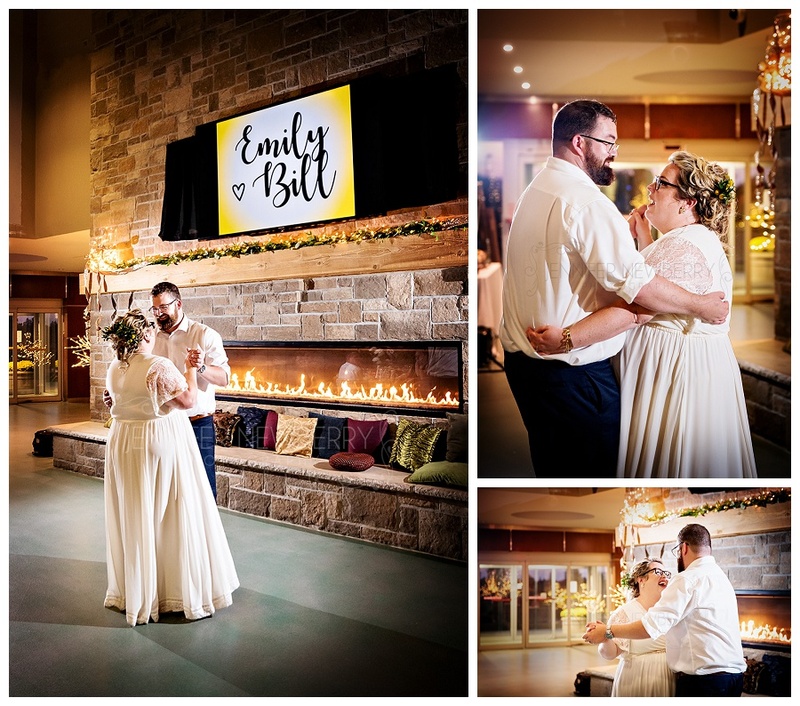 Congrats Emily & Bill! 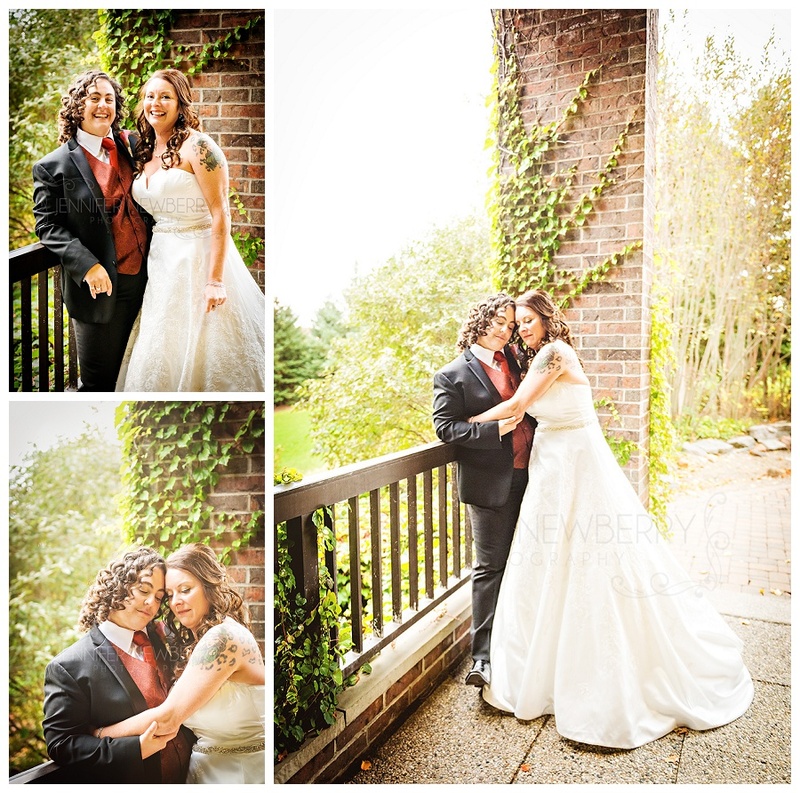 I hope you are having an amazing time on your honeymoon! 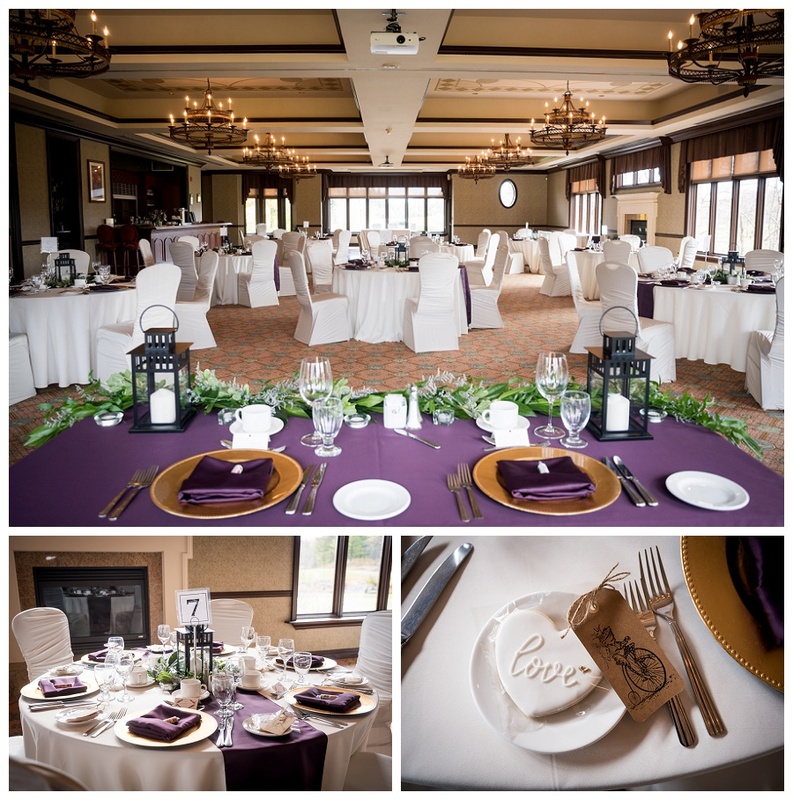 Are you getting married? 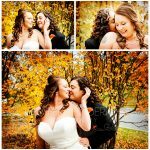 Looking for an Georgina wedding photographer? 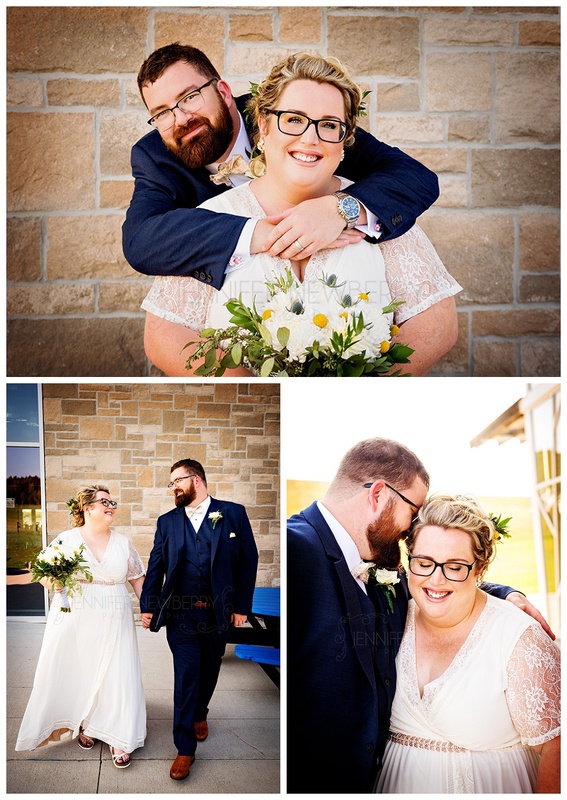 Get in touch to have me, Jennifer Newberry Photography, capture your wedding, whether it’s in Georgina, Sutton, Newmarket, Richmond Hill, Toronto, Barrie, Waterloo, Hamilton, London, Muskoka, or beyond! 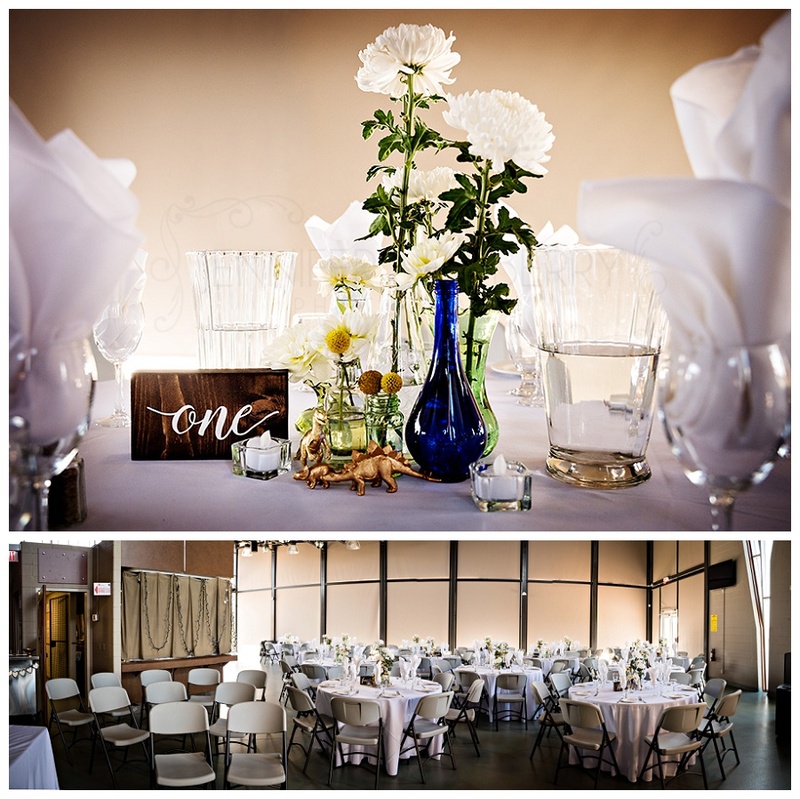 I’d love to chat about your wedding plans! 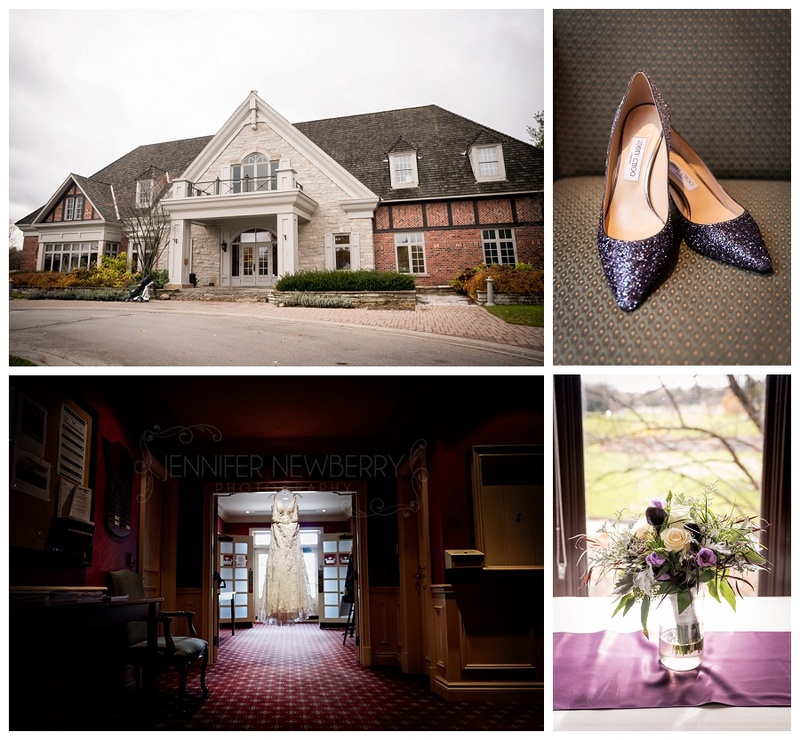 I can’t really think of any more to say beyond what I already said in Paula and Leanne’s wedding sneak peek blog post. 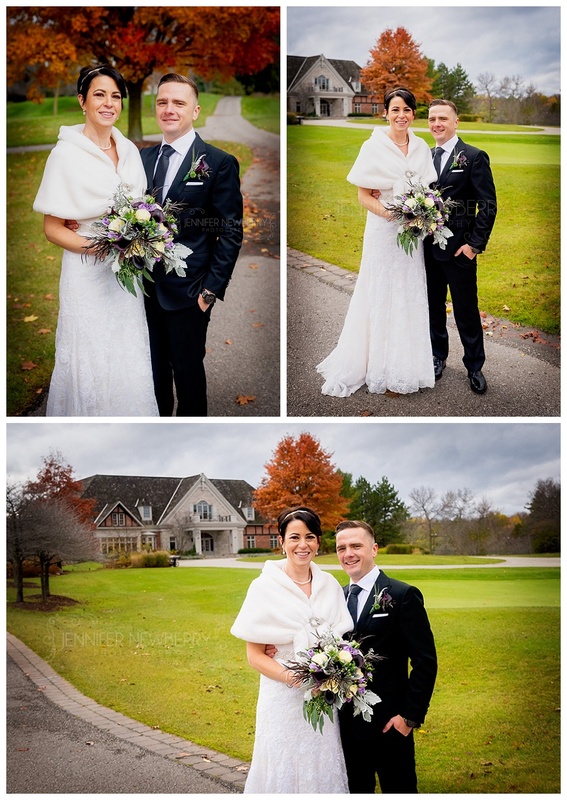 Their Kettleby wedding day at The Manor was perfect. 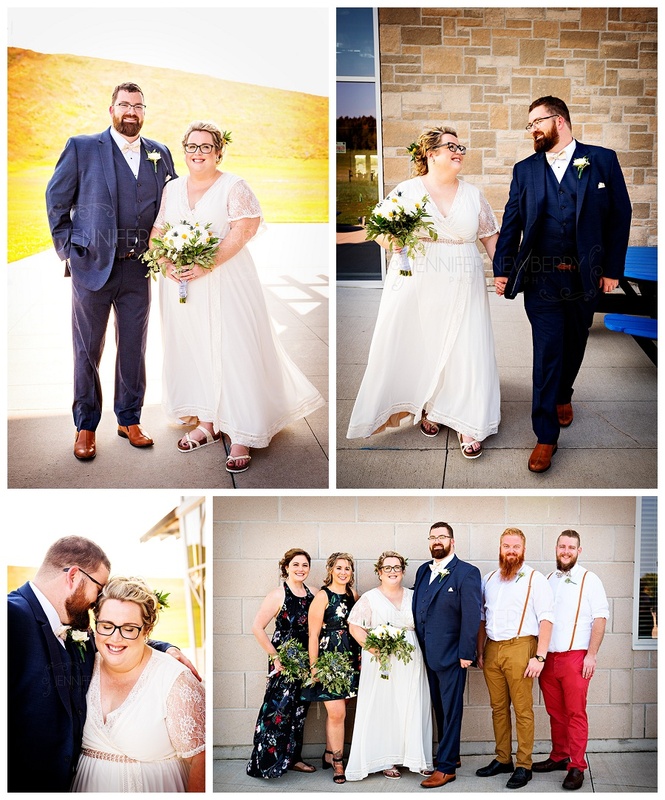 The weather was fantastic (a bit chilly and windy though), both brides looked beautiful, and the day was full of pure happiness and joy. Paula and Leanne met playing baseball (Ladies Slo-Pitch) in Richmond Hill. When they met, Leanne was intrigued. Paula’s first thought was “I’ve got to get to know this girl!”. They went on their first date at the Haunted Magic Hill Farm. 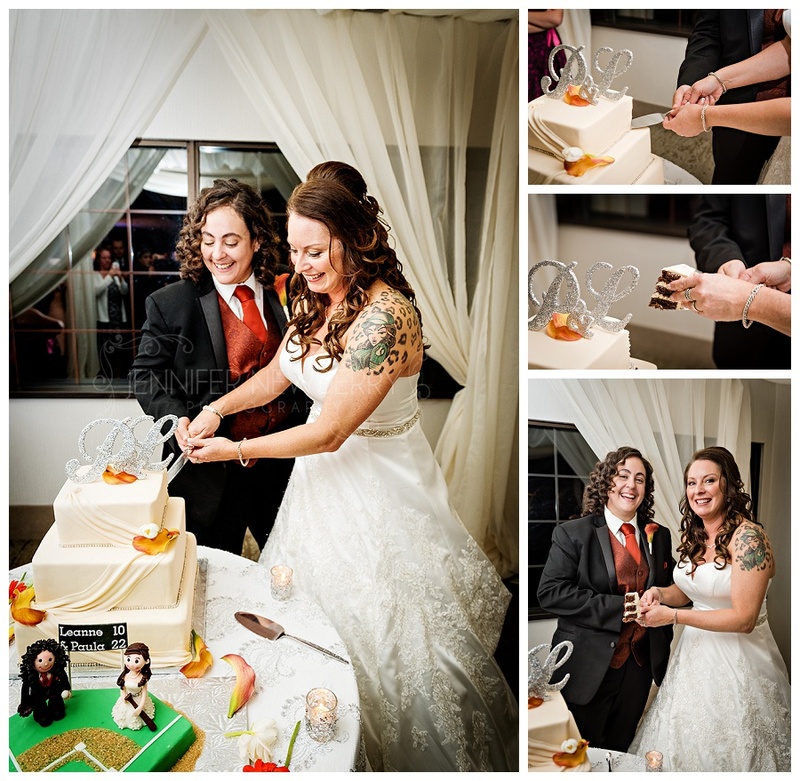 After five years of dating, Paula and Leanne went to a baseball game, and Paula proposed on bended knee. 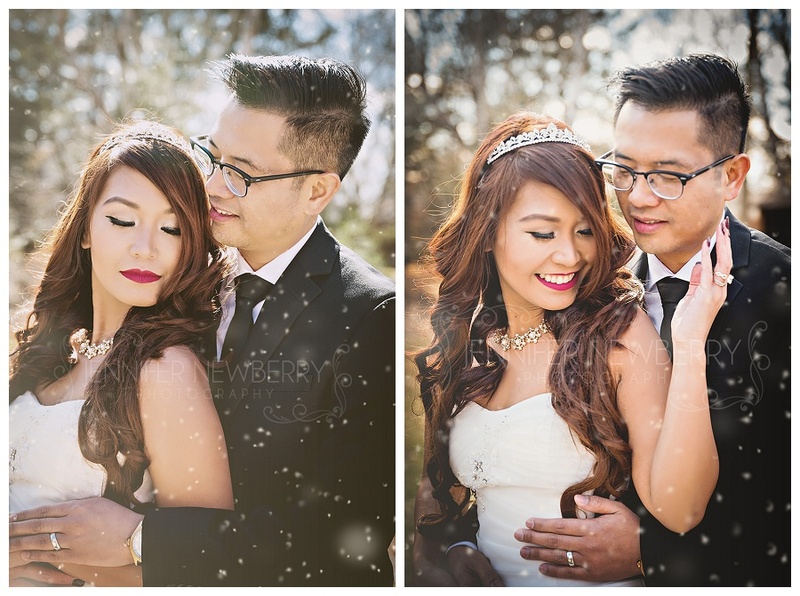 After a long engagement (another five years! 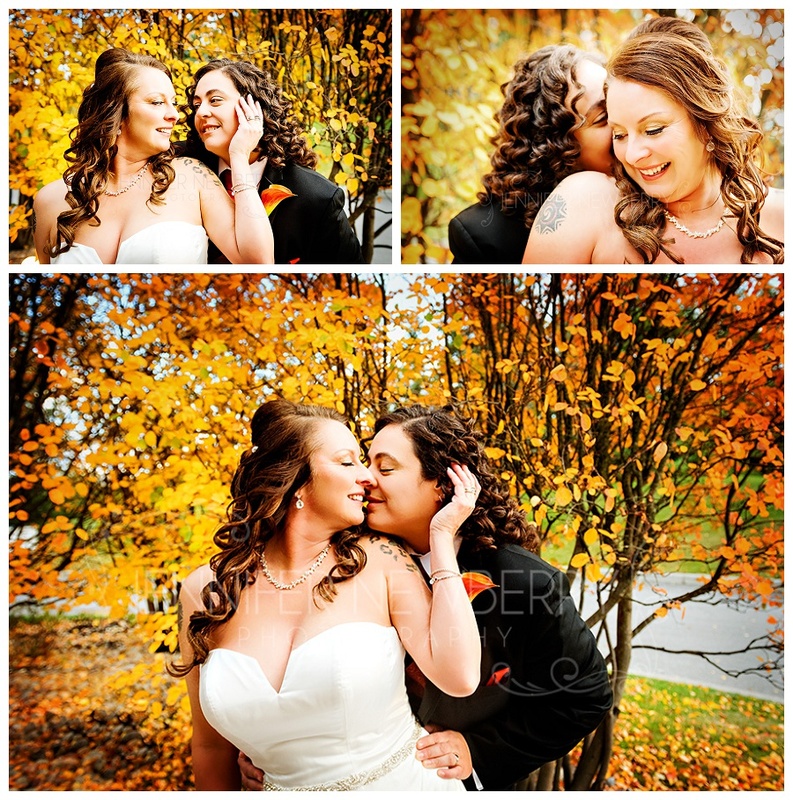 ), Paula and Leanne tied the knot on a gorgeous fall day in October, at The Manor in Kettleby. 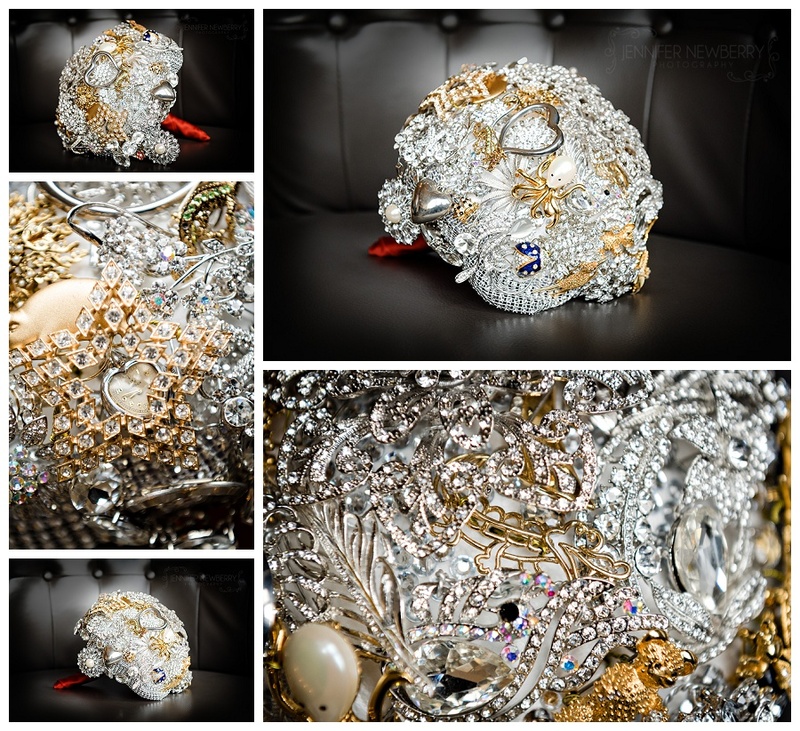 I’m not usually surprised by much when I show up at weddings, because I have a thorough pre-wedding workflow, but Leanne surprised me when I saw her brooch bouquet that she made herself! 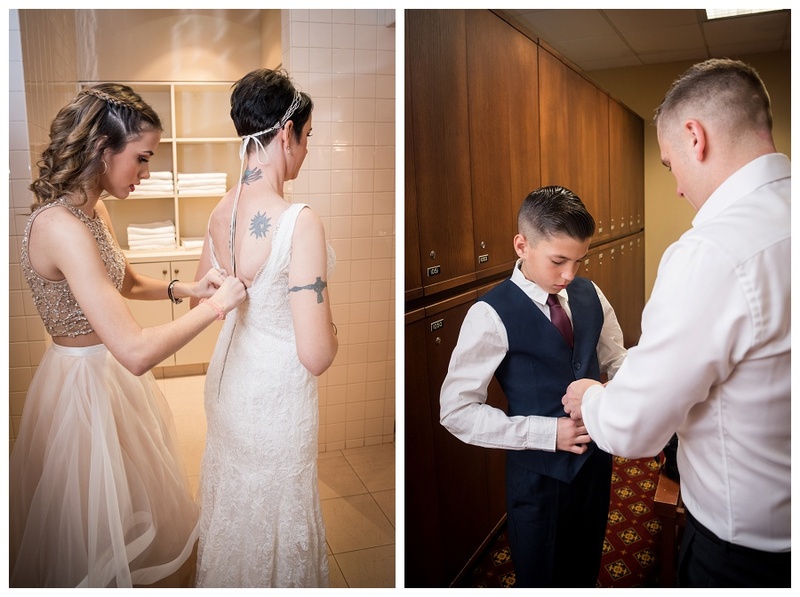 What an amazing job she did on it too! 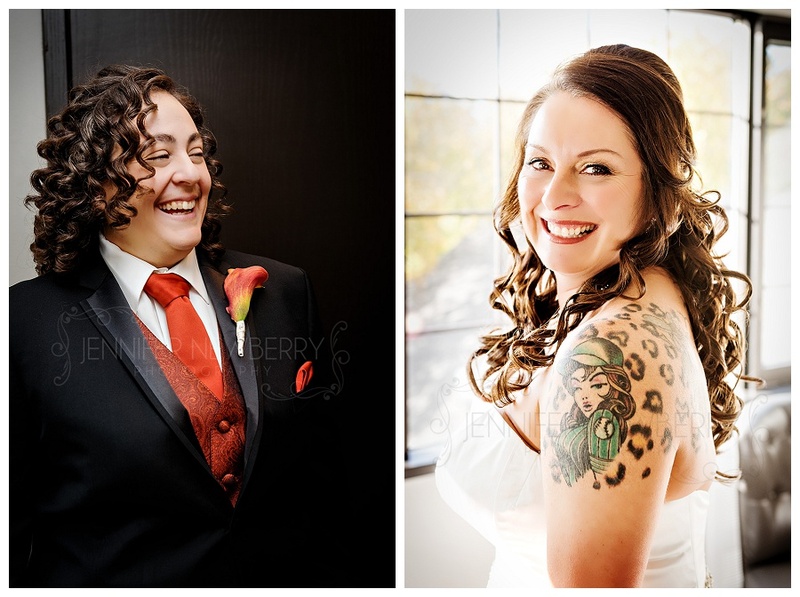 Before the ceremony, both brides were happy and excited! 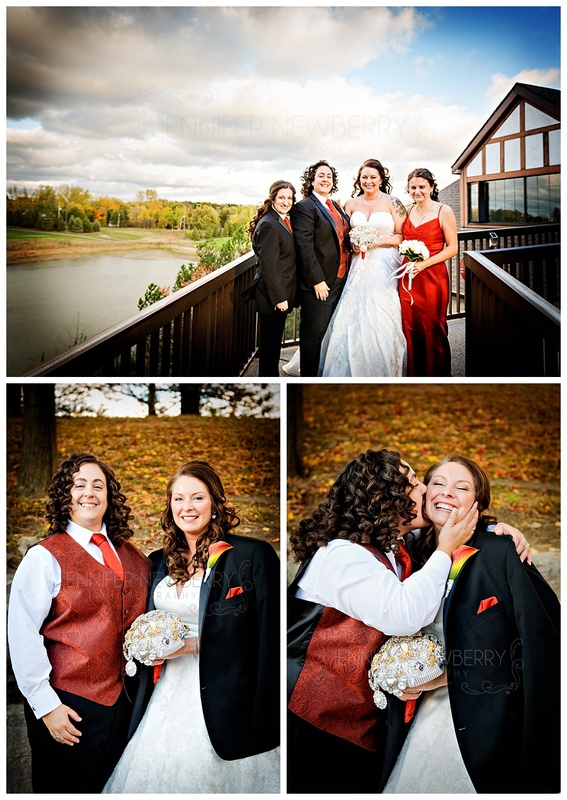 An indoor ceremony was planned, which was probably a good thing since it was windy and chilly (yet gorgeous) outside! 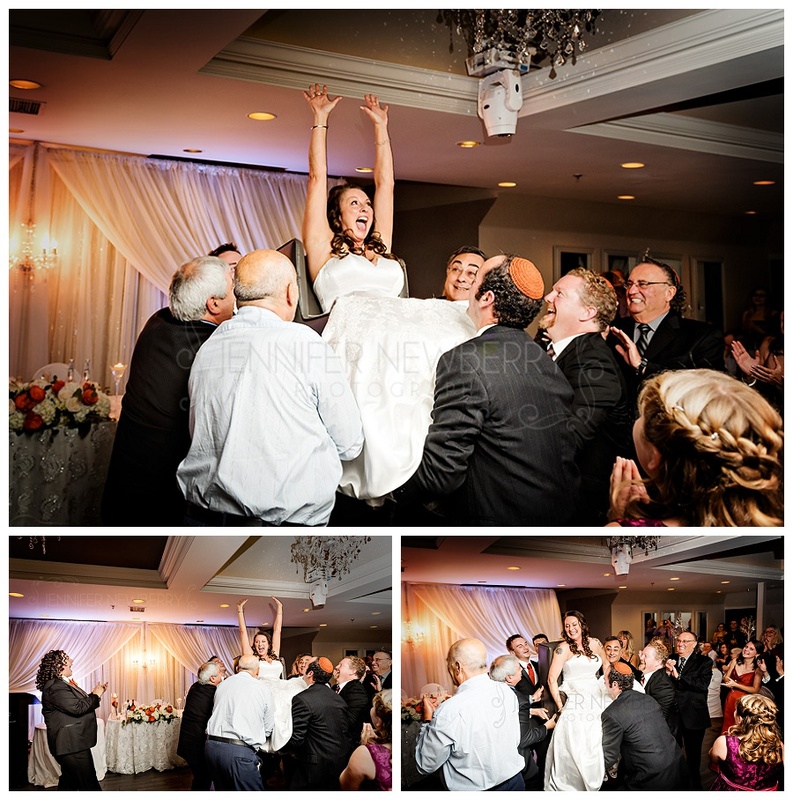 Following the reception entrance, there they did the traditional Jewish Hora dance. 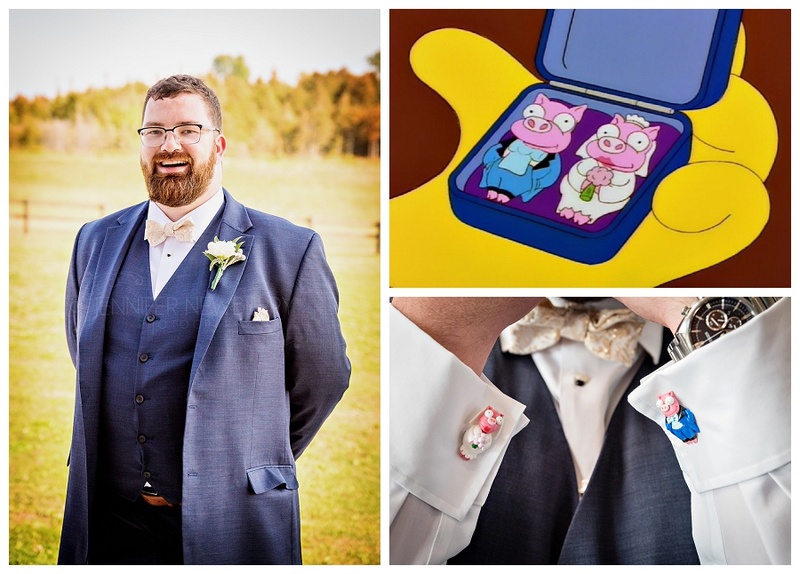 I love these cultural traditions, they’re all so unique and symbolic in their own way – and also usually a lot of fun! Paula actually fell off her chair the first time! I had never seen that before, but it wasn’t a big deal. 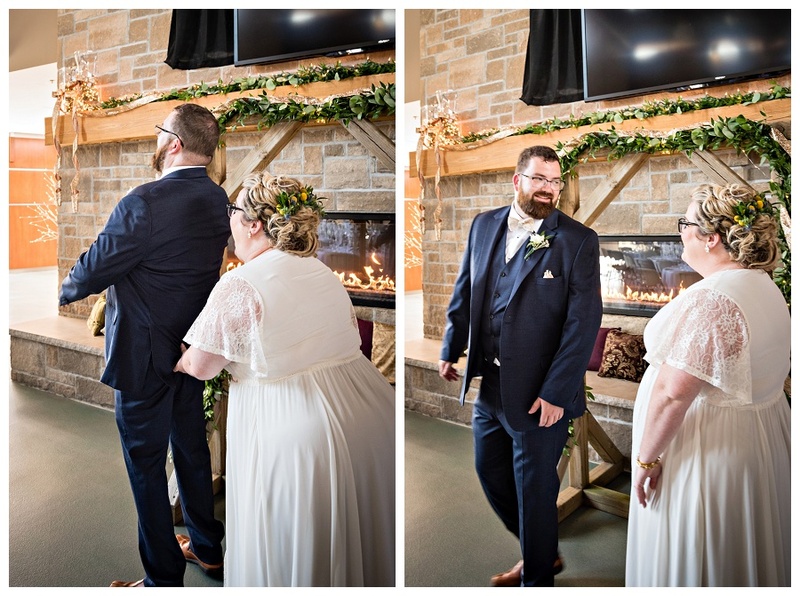 Everyone was laughing and having a great time! 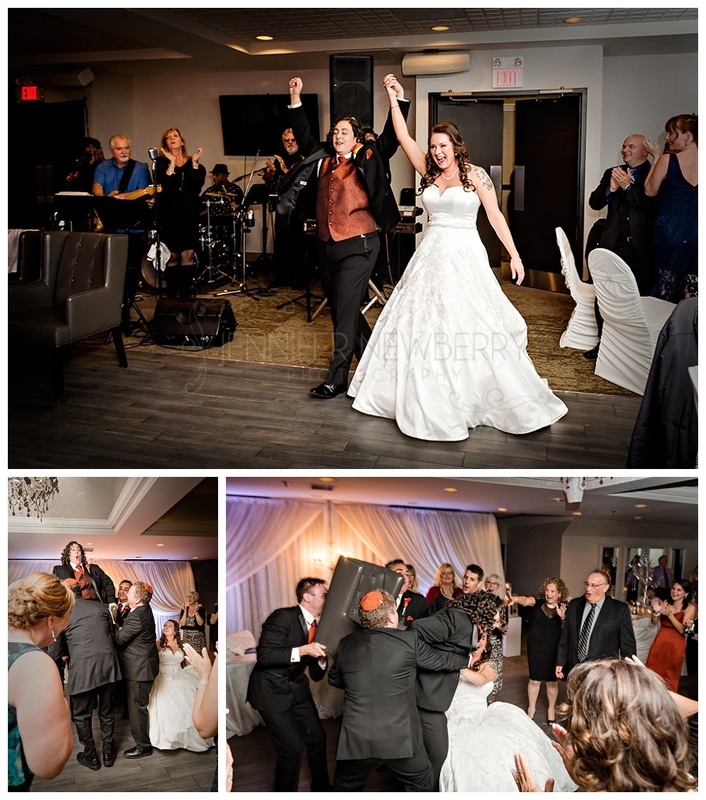 Leanne looked like she was having the time of her life! 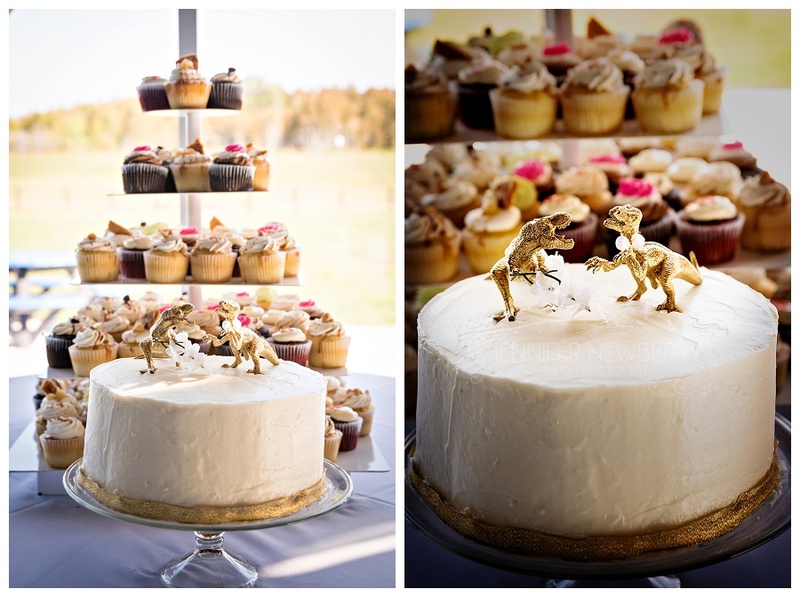 Look at the cakes! 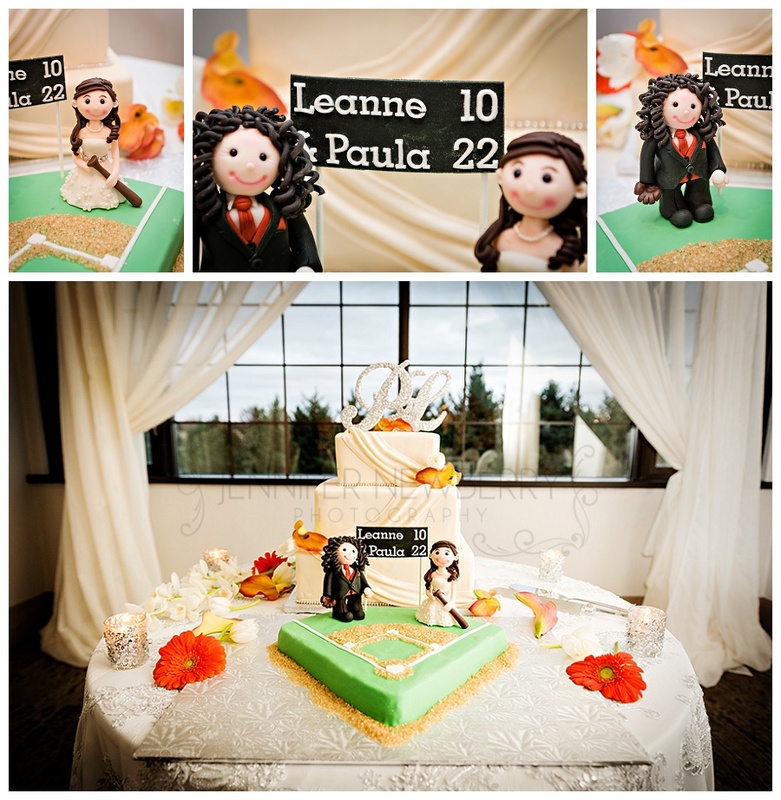 The attention to detail was pretty impressive! 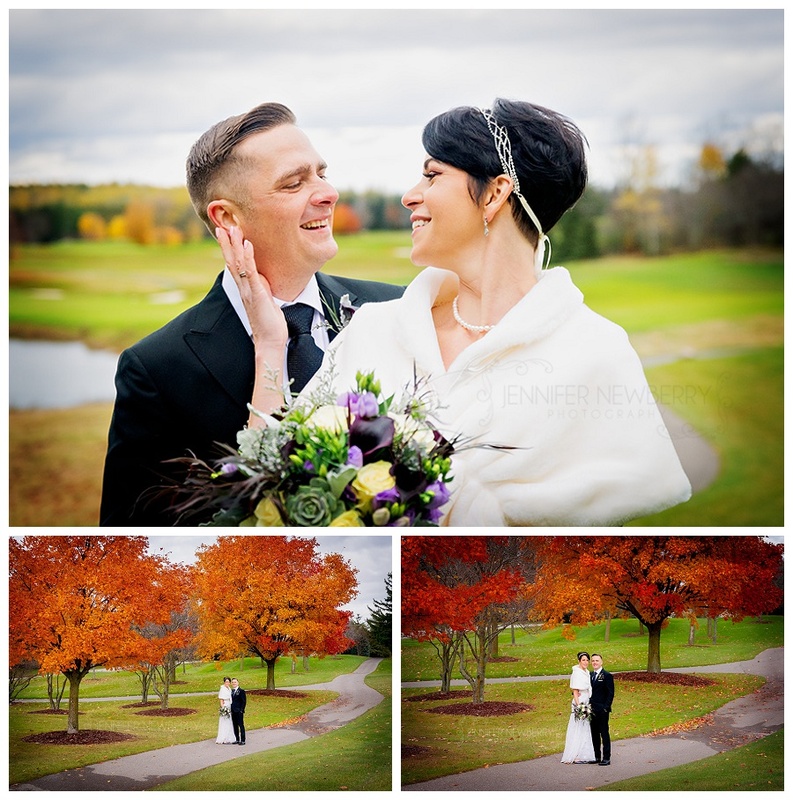 Kelli did a fantastic job! 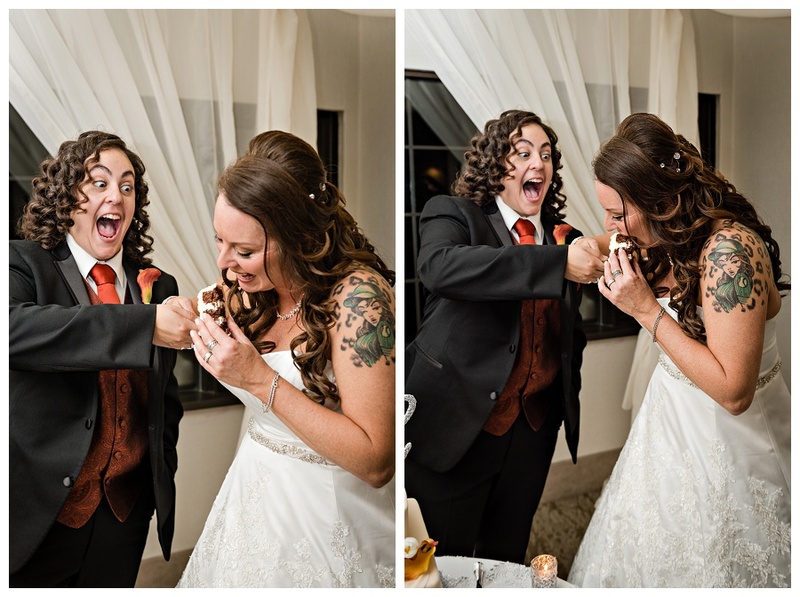 Thanks to Paula’s very expressive face, these two photos below are now officially my favourite “feeding the cake to each other” photos EVER! 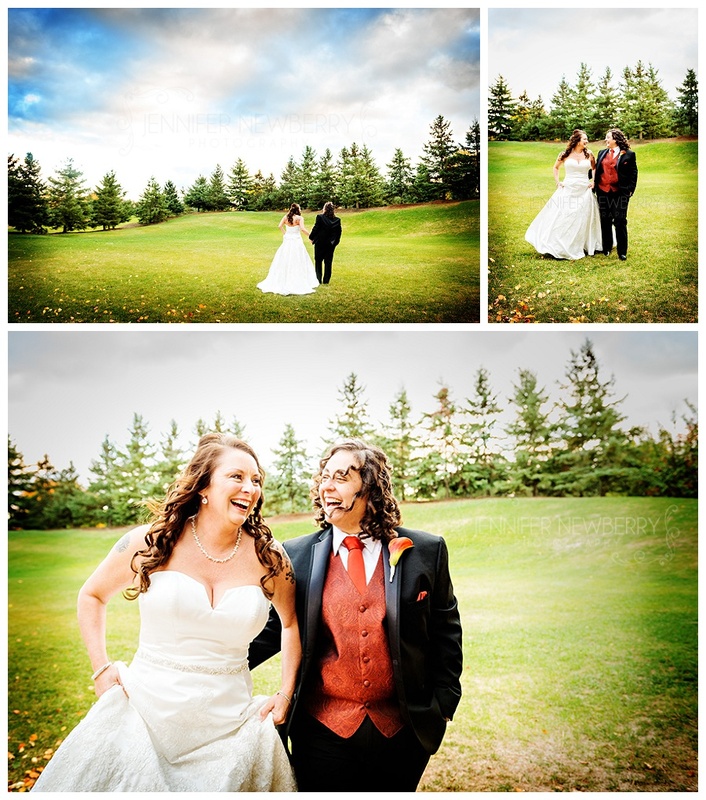 Thank you Paula and Leanne for having me be a part of your wonderful day! 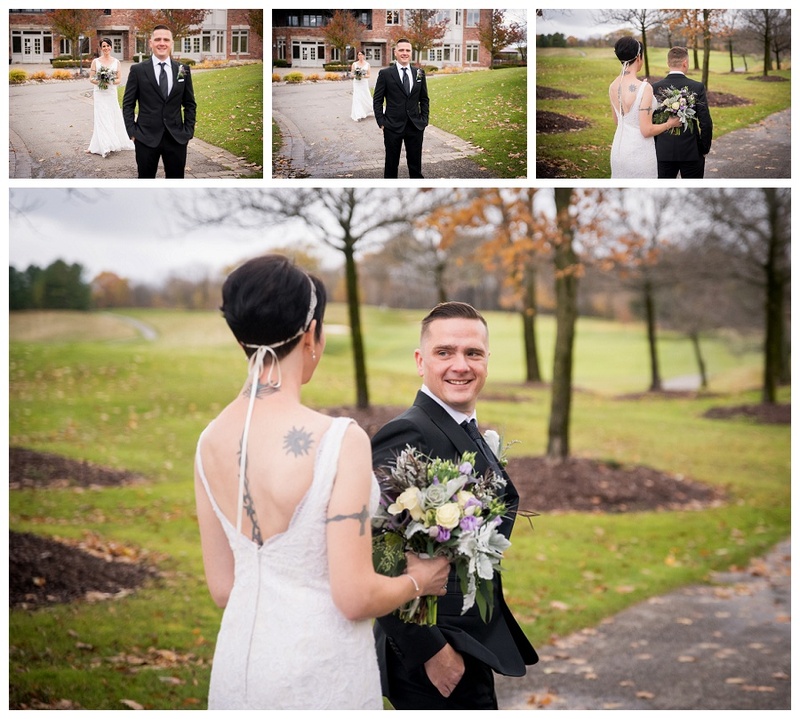 I had an absolute blast documenting your wedding!